Almost every suspension system consist of three different parts. Below is a short introduction to each part. You can also use the picture in the left column as a shortcut to our online product catalog. Just click on the part of the suspension system that you are interested in to learn more about our full product range. 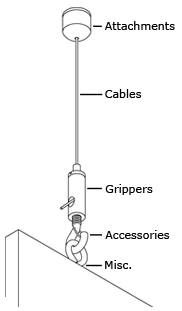 Attachments are used to fix the cable to ceilings, walls or floors. Depending on your installation situation we have several options for you to choose from. Ensure that you use suitable screws and dowels for the materials when installing. Cables provide a discrete and elegant way to suspend a product. Stainless steel and zinc plated cables are available in various diameters and lengths. Ensure that you use a cable diameter that suites the weight of your product. Compact designed grippers allow swift installation and instant adjustment without damaging the cable. We have many different gripper models to choose from, depending on your area of usage and weight capacities. Always match the gripper with the chosen cable diameter.